Moog Memorymoog synthesizer, Taurus II bass pedals, and DSC sequencer (Digital Sequential Controller) from page 39 of Keyboard magazine Feburary 1982. 1981 was around the time I first started reading Keyboard, so this 'family photo' is etched in my brain almost as deep as the real family photo that hung in my parent's kitchen directly opposite to where I ate three meals a day growing up. 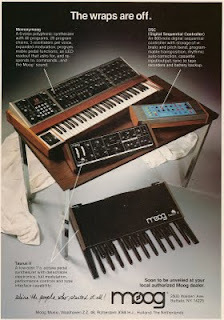 It was actually a follow-up ad to Moog's January 1982 advertisement where the gear was covered up. Ads for the Memorymoog continued to pop up in Keyboard magazine well into 1983-84 (see my 1983 Memorymoog ad post) with later Moog ads suggesting more and more that the Memorymoog was the equivalent of six Minimoogs, as well as the promotion of the Memorymoog Plus (adding MIDI and two sequencers). I'll post more of those ads in the near future. Lots of Memorymoog information is available online, including Cary Robert's excellent Memorymoog Web site that contains a 1984 Moog liquidation flyer (What? - A Moog Source for $199?)! Vintage Synth Explorer and Wikipedia also contain useful info. The Taurus II pedals were also promoted in ads as late as 1983, and you can find most of the basics online, including the Taurus page on Wikipedia and Vintage Synth Explorer. I wasn't able to find much information on the Moog DSC, although the Audities Foundation has a page with some great close-up photos . Please post links if you have more information. That must be a very early prototype MM because to the best of my knowledge it wasn't released to the public until Nov 1982 or so.